Need a service? Check out our service list. Do you need technical guidance? Brochure or Catalog? The buyer and user of the product Centrometal company has secured technical support for products purchased through authorized service technician. Services are distributed throughout the Croatian territory, Bosnia and Herzegovina, Serbia, Montenegro, Macedonia and Kosovo. So for installation, commissioning and warranty service outside the warranty period, any user of the product Centrometal available to qualified person trained and authorized by the company Centrometal for these jobs. 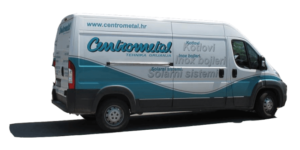 CENTROMETAL pay special attention to their supply of spare parts warehouses, warehouses were mentioned by region, covering all areas Croatian, Bosnia and Herzegovina, Serbia, Montenegro and Macedonia. As to warrant a good customer service organization serves Certificate ISO 9001/2000 which has more years. Map of authorised service. Find your area, increase it, and click on the nearest point within your location to get more information about authorized Centrometal Service..